There is a moment in every championships when the see-saw tips. From the hopeful anticipation of crews with the world at their feet before the early rounds, to the rollercoaster’s inevitable move towards the precipice of the finals. There’s no going back now, the semi-finals are swishing past in a blur of unstoppable tension, and the options are diminishing. Photo Crews find their options diminishing in Plovdiv as finals approach. Thursday was the tipping point in Plovdiv: in the absence of funny business with wind gauges and rules, and under a hotter than usual sun, a steady procession of quality racing lured us closer to the weekend. And my goodness is rowing breeding quality in depth. Long gone are the days when the top crews could breeze through heat and semi to their destiny in the final. 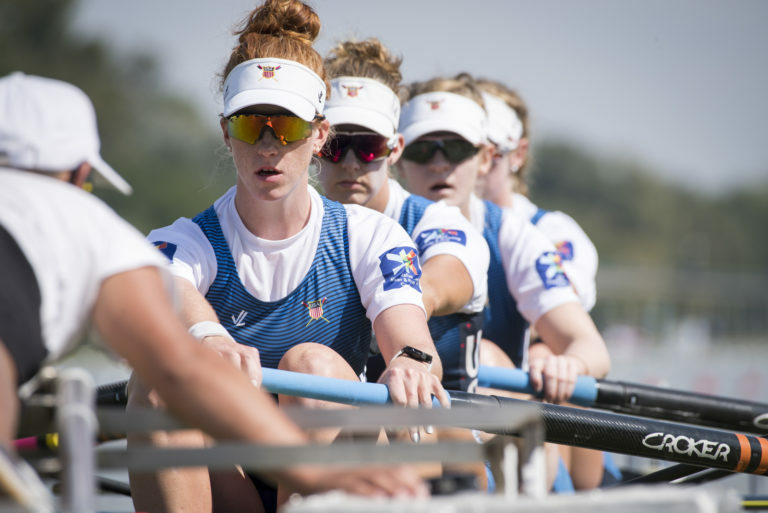 Quarter-finals are contested like medal races, and we regularly see C/D semis — this year in no fewer than nine events — fought to the hilt by rowers who have won medals in other years. We’ve got 19 PR1 men’s singles this year for heavens sake. And that’s after doubling the distance last summer. Photo The Sinkovic Brothers (CRO) on Thursday. The deferred races from Wednesday took priority, the men’s doubles reps going as expected with the US crew the nearest to just miss out on a place in the A/B semis. After that the men’s pairs started with a bang, the very first quarter-final developing into a four-way blanket finish between Australia, Britain, Roumania and Belarus in which the Belarussians very nearly dropped the ball by stopping a stroke early. Fortunately they’d already pulled far enough ahead of Australia to take third behind Britain, with Roumania doing the best sprint job to clinch a central SF lane. The other QF winners joining them were Canada, Serbia and (you guessed it) Croatia, the Sinkovics looking the most confident despite a tussle behind them to qualify. Later in the day the lightweight men’s doubles had to race semi-finals only 21 hours after their contentious wind-blown quarterfinals. Maybe we were imagining it but they looked a tad exhausted, though on the whole those with the better summer results went through. Spain justified their unexpected win the previous day by beating Britain for third and closing hard on New Zealand, and the Irish duo summoned one last reserve of energy to defend third against Poland. 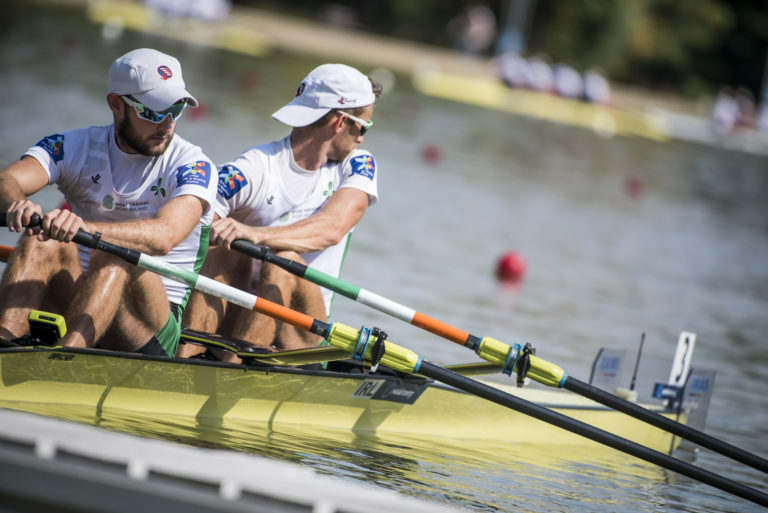 Photo Ireland’s O’donovan brothers race again only 21 hours after their contentious quarter final. We also had the little matter of some men’s singles quarter-finals, race three of five for those who have had to come through the reps route. The draw everyone would have wished to avoid was the third, pitting Synek against Borch, but the previous race was also pretty fierce, Griskonis having go number 37 at Manson — the Lithuanian never gives up, to his credit. Unfortunately for him the Kiwi easily capped his efforts, tapping along comfortably at mostly 38. Synek took the opposite approach — no heedless ratemeister he — and lorded it over the Norwegian at a lower tempo while Serbia’s Marko Marjanovic kept a wary out for relative youngster Romuald Thomas from France. The other two QFs were a mixed pair, Brit young gun Harry Leask impressively winning the arguably easier draw, while under-23 Oliver Zeidler unsurprisingly bossed the other. 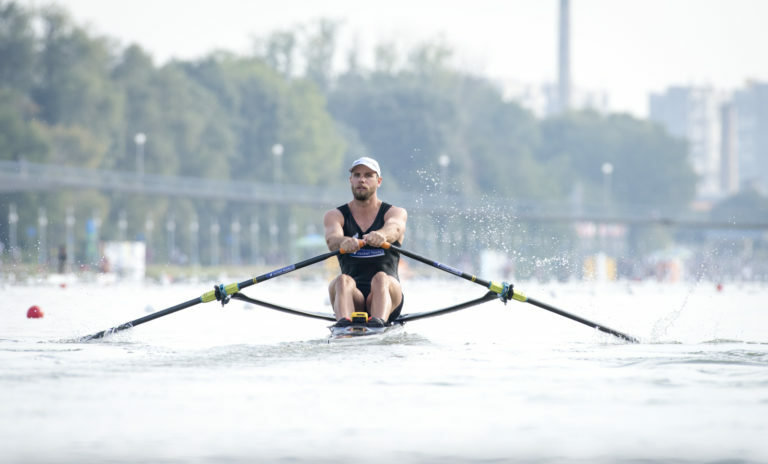 Photo Robbie Manson (NZL) racing in the M1x Quarterfinal on Thursday. There were two sets of Olympic-class quads to deal with, facing their the last hurdle before the final. China and Poland led the two women’s semi-finals home, with Australia scrambling behind China but unable to reach third as Britain swept past the Americans ahead of them. 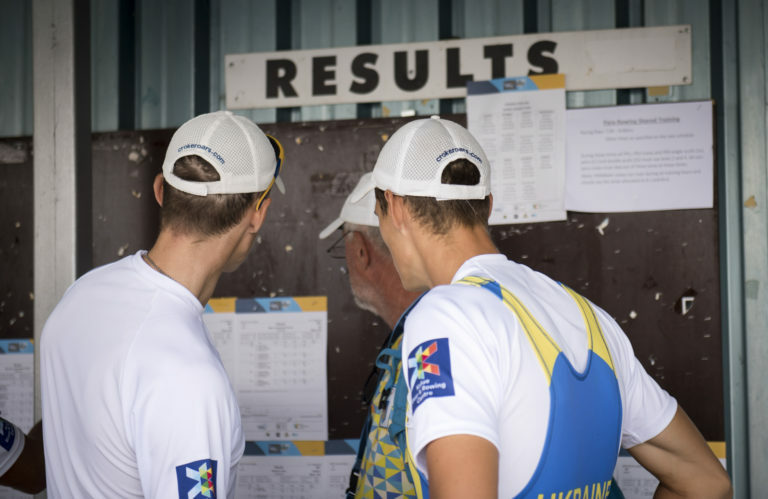 Each of the men’s reps had three crews who could qualify, but only two places to spare and it ended up being the 2017 gold and silver medallists who lost out as Lithuania and Britain failed to make the grade. Britain’s late charge wasn’t enough to worry either the Dutch or Italians, while New Zealand became the joker in the pack of the other repechage. Fuelled by their famous 2-man Mr Drysdale, the Kiwis thoroughly discombobulated the initially leading Aussies and briefly gained an upper hand before the green and gold crew flashed past again, the sprint between the two keeping them just ahead of Lithuania. 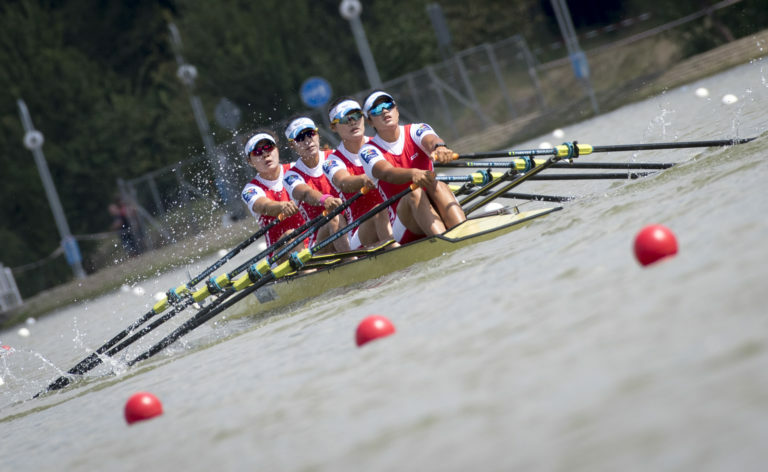 Photo China take an unexpected win in the W4x on Thursday. There were also reps for the PR3 mixed coxed fours, which led to one of the most bizarre sights at a worlds. Sri Lanka, coming in fourth nearly a minute after Russia, were initially treated to a storm of cheers and whistles from the grandstand. But as they raced to the line, spectators realised that shouting had broken out about 150 metres up the course. Fifth-placed Tunisia, whose crew spans three clearly argumentative decades, had stopped racing and begun turning into the warm-down area when whoever took that decision was audibly yelled at. 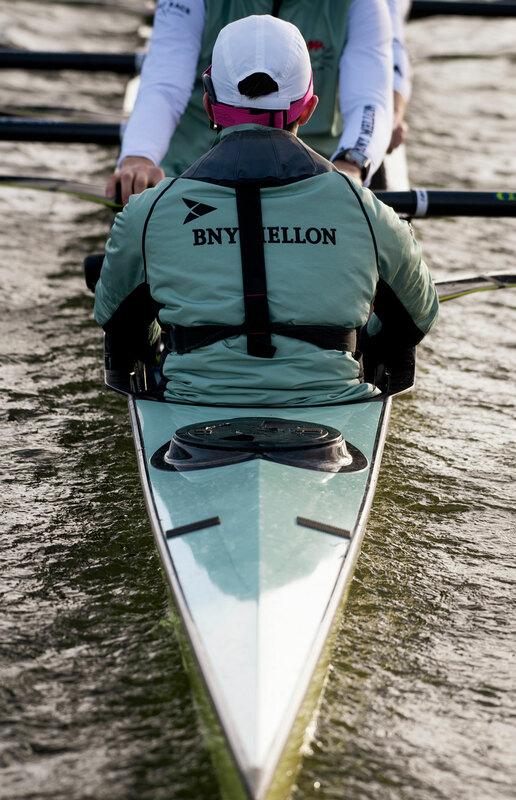 For a moment the crew hovered stationary, blades turning it first this way then that and yelling blue murder at each other, until more bellows from their irate coach got them to realise they had to finish the race if they wanted to be allowed into the B-final. The A/B semi-finals were delicious for some and devastating for others, but boring they were not. In the lightweight men’s singles Swiss Michael Schmid got a nasty shock when Hungary’s Peter Galambos finally pulled his finger out and shoved Schmid to the limit for the win. Behind them China’s Man Sun was quite a revelation, and may be even more dangerous in the final, while Jason Osborne (GER) beat Andy Campbell Jr (USA) in other semi. Osborne, by the way, apparently finished 8th in the German road cycling championships this year, and is in talks with Team Sunweb to join them as a professional next season — so this may be the last time we see him in a rowing final. Keep up with all Row360 world championship coverage this week here. New Zealand’s Grace Prendergast and Kerri Gowler came into the women’s pairs semis unconquered since Rio, and left it with their perfect Olympiad cracked right across by Canadians Caleigh Filmer and Hillary Janssens, who beat them by nearly two seconds in a genuine battle. The other race got close to being a five-way dash to the line, but with Ireland, Italy and Spain just moving far enough ahead of the USA and Canada to be sure of their qualifying places. The women’s fours, by contrast, looked a tiny bit leaden but were very closely contested at the qualification borderlines, especially in the first race where four crews spanned four seconds. Yet they weren’t all the ones you’d expect, after European runners-up Roumania came in flat last, and their Glasgow conquerors Russia scraped in third ahead of the Dutch. The beneficiaries were the US and Australia in one race, and Denmark in the other. And Australia were even more in charge in the men’s fours, although for the first time in a while they showed signs of a little Achilles heel as the Dutch and Roumanians hunted them down relentlessly in the final 100m. 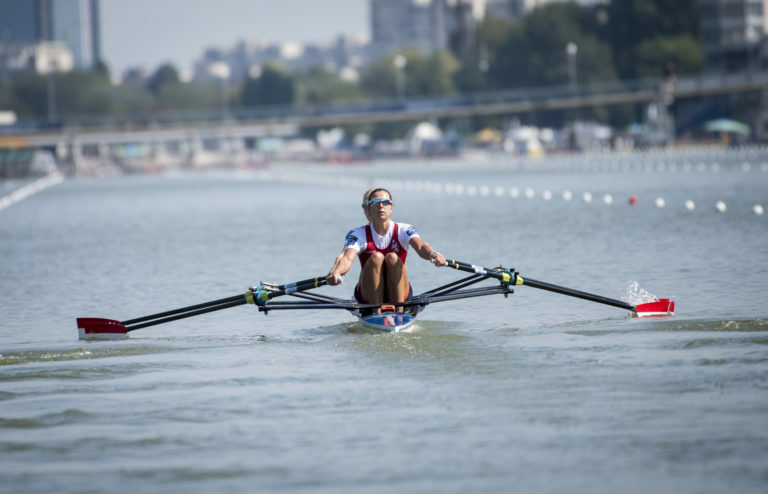 I’m in at least three minds about what I think will happen in Friday’s lightweight women’s singles A-final, after front-runners Alena Furman (BLR) and Imogen Grant (GBR) were both pushed hard by France, Italy, USA and Canada, yet each looked as if they had a little in hand. For the LW2x semi the Dutch also looked deceptively steady in one semi, but the other much faster semi featured a fantastic double photo-finish: Roumania sneaking past the USA for first, and the Swiss edging out Canada behind them. It’s all turning very serious now and while the best performers are starting to rise to the top, many events still feel wide open. And on Friday, the first medals will be awarded.